I drew Lumpy Space Princess in royal princess garb. I can't decide if LSP is my official spirit animal. It's between her and the Dowager Countess from Downton Abbey. So much sass! Do you not have it for a print order? Would love to have this on my wall! That's how she, like, makes sure things aren't lumping filthy or whatever. GLOB! YES. THIS IS PERFECT. So much majesty. I love the choice of colors as well. I'm gonna call this "Queen Gummybuns"
Oh my glob! Giving her fancyfancy gloves was a super cute idea. Love this! I don't think I can approve more of your spirit animal(s). Bravo. Heehee, she is so awesome! "I'm in some fan art, Mom and Dad! Lump off! Lol I love LSP, would you be making any more adventure time characters? 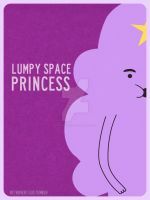 Looking at this makes me a tad worried to see how LSP would run the Lumpy Space kingdom. But yeah, great texture use here man.